I’ve only read one other “Junior Bender Mystery” (see my review of Fields Where They Lay) and to be honest, both times I had requested the book from the publisher based on descriptions of the story – I was not aware that either was a part of an ongoing series. Junior Bender is a criminal. He is a professional burglar and he’s pretty good at his job. As this book begins, Junior is in the process of stealing a very rare stamp from a well-fortified residence. Such burglaries are always highly risky, but this one seems to have an additional complication… the residence belongs to a professional killer. That fact alone would rattle the nerves of most, but Bender is a professional – he doesn’t get too worried about it. Until the owner returns home with the express intent to kill the burglar currently in his home. So begins a frantic tale of crime, blackmail, and murderous intent. The idea of a burglar leading a crime/mystery series is wonderful. I don’t know the mystery genre well enough, but I suspect this isn’t the first such character device. One of the things I really like about Junior Bender is how ‘down-to-earth’ and ‘real’ he is. Author Timothy Hallinan creates a character that could very easily be the guy next door – a criminal, sure, but what do you really know about the guy next door anyway? And the plotting is really nice. The story is involved. It is deep and earnest and as with any good dramatic story, there’s plenty of conflict – simply staying alive is great motivational conflict. And yet…. Everything here seems like such a great fit and yet I never really bought in. I don’t really care about my next door neighbor beyond a “hello, how are you, your yard is looking good” and I don’t really care about Junior Bender. I think it has a lot to do with his profession. He’s chosen to be among the criminal element and that comes with some inherent risks. Still, I’m sure there have been literary characters that I’ve liked and cared about despite their past or profession, so it is something deeper. There’s a lack of connection between me and this character. I read his story from a distance instead of being pulled into the story and a story from a distance just doesn’t have the same excitement. Looking for a good book? 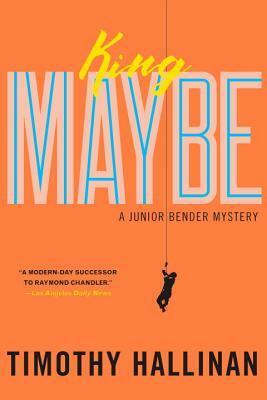 King Maybe by Timothy Hallinan is a Junior Bender Mystery adventure that includes a well-defined character and strong story but you read it as a distant observer. I received a digital copy of this book from the publisher, through Netgalley,in exchange for an honest review.